Hey there! I'm Sheri, I am a concept artist currently located in Edmonton, Alberta. My passion is creature and character design; my work up until this point has been focused on honing my draftsmanship and technical understanding of anatomy and biomechanics for original and client based work ranging from casual to professional study, portraiture, and design. I'm presently looking for work that allows me to be a part of a creative team to apply my skills to the development of memorable characters and designs in the realm of games or television. For more informal, personal pieces and presentation, please visit the pages listed under "Personal Works". Orthographic charts and other technical studies are both an artistic focus and personal interest as a skill. 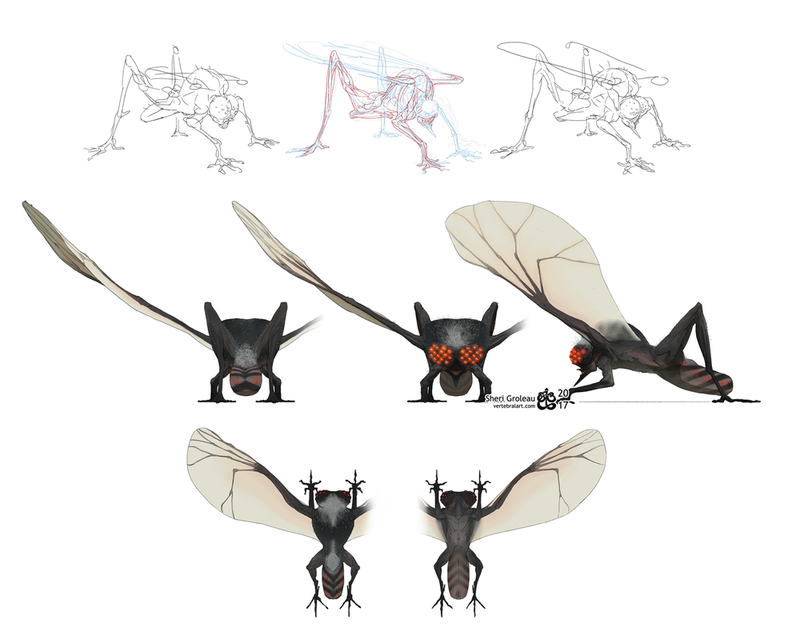 When approaching creature and character design, I explore theoretical biomechanics built off of practical knowledge. I use ongoing personal projects such as "The Infernal Opera" as a means to allow me consistently develop and hone my skill set; some excerpts of which are featured below alongside client-driven projects, designs, and explorations. 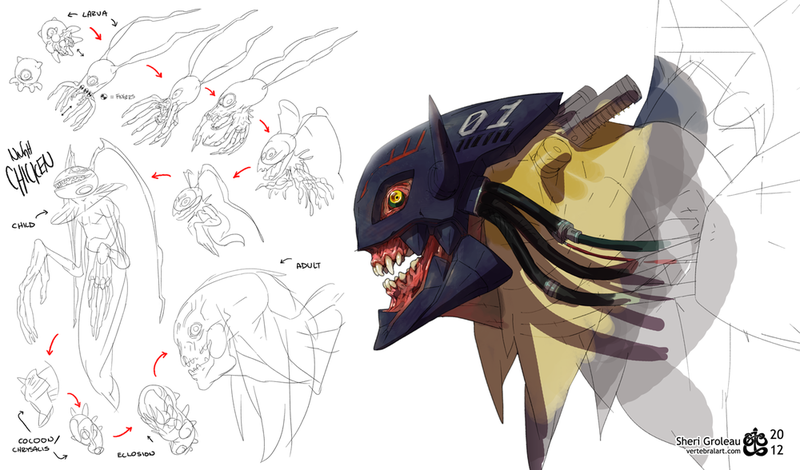 Above: Character design and technical art for a 2D brawler, done between 2012 and 2013. Art direction by CJ Canon. Below: Experimental character designs done in the spirit of Beetlejuice, Coolworld, and Doug Tenapel's Earthworm Jim. The Infernal Opera is an exercise in visualising vastness and variety. Hell stretches for light years in every direction, and every mile is populated by creatures and cultures shaped by a desire to survive and serve a landscape that chews and grinds everything that walks upon it. As a long-time gamer, reader of comics, and consumer of Saturday-morning cartoons, many IPs have had a lasting impression on me as an artist. Revisiting and reinterpreting an IP and its characters through a different artistic lens, or just indulging in it as a whole, is a recurring pastime between client projects and other works. These mini-projects are generally approached with an interest in application of general real-world science to fantastical concepts, ideas of species and cultural variation, and exploration of in-setting biology and ecology. As an industrial Pokemon, Magmar are a "manufactured" genus, engineered and guided by eugenics to fulfill a specific purpose within a working pipeline. Magmar are common in smelting and manufacturing operations, where they work in high-heat and potentially toxic conditions in tandem with machinery. Like their industrial cousins, Electabuzz and Conkeldurr, they are believed to possess human-like intelligence. Magmar populations are carefully controlled by Silph Co. and are as a genus barred from casual ownership by trainers and collectors. The species is notorious for its propensity to drastically alter its environment to suit itself if able, setting fire to vegetation and buildings to raise the ambient temperature to better align with its comforts. Adult Exeggutor are producers, with some species also falling within the consumer population. Other consumer Pokemon species feed upon and rely on them to maintain and sustain their ecosystems. Exeggutor provide shelter, nutrients, as well as food and access to prey to other species. The presence of Exeggutor often denotes and / or produces a very healthy, diverse, and stable ecosystem. In some cases, the Pokemon itself is an ecosystem. Areas populated by the species are often untouched by human hands due in part by the Pokemon's special ability, "Hypnosis", which permits the Pokemon to ward away invaders. Intruders who venture into their ranges are quickly hypnotised and sent back to whence they came or, in cases of encounters with carnivorous Exeggutor, eaten. Between client and personal projects, I produce personal studies to expand my visual library. To augment my income, I take commissions from my online audience. These client-directed projects take multiple forms, including portraits, original designs, and various character and anatomical studies. During the summer of 2015 I tried my hand at a Pokemon-related art challenge focused on the idea of "what if" crossbreeding Pokemon created visually distinct offspring. After an initial experimental set, some clients took interest in the designs I had come up with, and commissioned more to be created - with some designs guided by client preference and some left to my personal interpretation, keeping to the tone of the original set. This resulted in the creation of nearly 100 unique designs between fall of 2015 to spring of 2016. Some designs were paired with flavour text built off of features suggested through the in-game Pokedex, implied biology of the new design, or suggested by the client.